As many of us are all too well aware, the job application merry-go-round can be drawn-out and dispiriting. My own experience is probably fairly typical, but I recently came across a scheme that provided a real boost, both to my confidence and my prospects of gaining a foothold in my chosen career in the Civil Service. It was a boost that was well overdue! I had tried many different jobs, both paid and unpaid. I graduated in 2013 and was expecting to get into work quickly. Unfortunately, after securing my first job I was made redundant, which came as a real shock. I then volunteered and undertook short- and long-term internships in charities and NGOs, while I applied for numerous different jobs and attended a succession of job fairs and networking sessions. Before my current position, I was out of work for about 5 months, suffering a series of rejections, which was difficult for an ambitious graduate like me to take. The whole experience of applying for jobs was stressful and keeping motivated was very hard. I wanted to build a career in the public sector, but I couldn’t see how this was going to happen - until I became aware of Movement to Work. 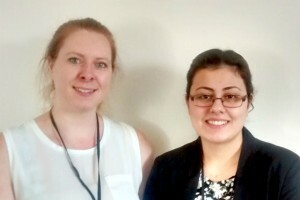 Through this scheme I was able to stay engaged in job searching while gaining experience of working in the Civil Service and developing my skills within a really friendly and supportive team. During my 5 weeks’ work experience I was made to feel part of the team and encouraged to get as involved as possible. This meant much more than basic office admin duties and sitting at my desk. I took part in a range of interesting tasks, including conducting research on election guidance for civil servants, going to an all-staff event and attending a Public Administration Select Committee hearing on Civil Service Skills in the Houses of Parliament. I worked on my editorial skills by compiling editions of the cross-Civil Service publication HR Headlines; and was given an insight into how policies are developed through contributing to a youth unemployment policy meeting. Attending the Top 150 event for leading civil servants gave me contact with the senior leadership from the HR profession. And for increasing my understanding of the wider political landscape and engagement with the democratic process, one of the most instructive opportunities was taking part in an interactive mock election workshop at Admiralty House in Whitehall. I learnt more about the HR function in the Civil Service and had valuable CV/interview sessions with team members in my host department. Each day was an opportunity to learn and broaden my experience. Most importantly, I was able to stay motivated and engaged about the future. Now, the experience I gained on Movement to Work has helped me secure a job at the Cabinet Office as an HR Project Pool Officer. If you are aged 18 to 24, interested in a public sector career and my experience strikes a chord, or if you are at an earlier stage in the job-seeking process and looking for a way to short-circuit it, I would encourage you to learn about Movement to Work as a way into the Civil Service. It’s working for me!